Western spice bush (Calycanthus occidentlias) under some severe heat stress in this part sun foothill garden. Is more water the answer? I’ve been receiving several questions over the past month or so about plants that have been doing fine for years, but suddenly this summer are looking ragged. This is occurring in gardens that are sufficiently watered, or in the same way they have been watered through the drought. So, what’s going on? It’s quite possible that it’s just too hot. But wait! Now that we are planting “climate right,” “drought tolerant,” “low maintenance,” and “low-water-use” plants, they should be able to look great all the time, right? Most research is done for agricultural crops, so there are still a lot of questions about how extensive high heat, in both soil and air, affects many ornamental plant species like the ones that have become popular in the last five years or so. In many cases, we are still left with making something of an educated guess on whether or not our plant is suffering from 1) too little water; or 2) too much water; or 3) heat stress. But as our climate continues to warm, with extreme high temperatures, especially at night, becoming more common, we will want to consider heat stress as a factor in our gardens, related to, but distinct from added water. All plants have a range of temperatures in which they thrive, based on the climate they evolved in. However, most plants have tolerance for growing outside their preferred range. This is especially true of landscape plants that have lasted in the nursery trade and in gardens for more than a season or two. Tolerance is a range from barely surviving to looking okay but not spectacular. Most common landscape plants have a high tolerance for non-optimal conditions, so they look pretty good year-round, even if they originated in a different part of the state or country. Plants can be stressed due to extreme cold or heat, in either air or soil temperatures. Plants that have less tolerance may show extensive symptoms of stress, but will survive. In these cases, the goal is to reduce the stress if possible and/or develop seasonal tolerance for less-than-perfect plants. Full sun is just too hot for these low-water-use, shade-loving Heucheras in an inland garden. (right) Too much water will probably just kill them quickly. They are likely to survive the summer heat, since they are established. The organic mulch can help. The plants near the stones & gravel walkway are suffering the most, another sign this is heat and not water related. There four kinds of heat stress to plants. Heat stress due to extremely high daytime air temperatures is probably the easiest for plants to recover from as long as they are adequately watered. Over watering can help plants deal with heat stress in species adapted to high-water-use, but encourages root and crown rot-causing soil bacteria which can be fatal to low and moderate-water-use plants, so some trial-and-error or calculations and observations may be needed to get the right balance, especially for new gardens where you and the plants are just learning each other’s needs. Heat stress due to high night time air temperatures is harder to overcome. There are still a lot of unanswered questions of exactly the mechanism and triggers describing how plants, especially low-water-use species, absorb water and gas from the soil and air, and release gas and water vapor into the air. But high heat at night has a detrimental affect on many plants’ ability to take in and release water and gases, and thus it limits photosynthesis, which is needed for survival and growth. Another part of heat stress is due to high soil temperatures. Soil temperatures rise and fall, but more gradually and in a delayed fashion, as air temperatures change. Usually, soil temperatures at common root depth (20 inches) is about 20 degrees cooler than air temperatures. Most plants grow best in soil temperatures of 65-75 degrees Fahrenheit. In our area in July and August, average soil temperatures can be 85 degrees F. Even in September, the average soil temperature is 80 degrees F. or above. The worst kind of heat stress is all of the above, plus wind, even fairly light but steady breezes. Yikes. Most plants don’t do much more than survive during this phase. In this phase, even cacti might turn to mush and collapse, as they can not open their stomates to transpire and cool themselves off. 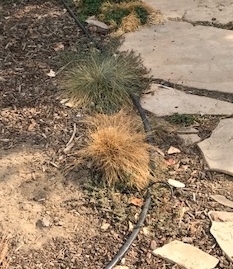 Ornamental blue fescue often does not care for the high heat of our inland gardens….notice the difference between the one in the sun and the one in the shade. Both receive the same irrigation. When we have these long periods of extreme high temperatures both day and night, the way we have had this summer, plants are not able to photosynthesize sufficiently for optimal plant growth. Some plants, like okra, love these high temperatures of both air and soil. Most of our ornamental plants, however, are not adapted to thrive in them. They may be tolerating the heat stress, but there will be symptoms of distress. In mild cases, heat stress will limit flowering and cause leaf tip browning, or older leaves will turn brown and fall off. In severe cases it will cause symptoms ranging from sunburn to leaf and twig death. Most signs are not apparent immediately; rather, it may take a few days to a few months to see. With some plants, stress symptoms are visible only after the weather has cooled down and the plant is finally able to “take stock” and shed dead cells and start to regrow. We are now seeing effects of heat stress from July in many of our ornamental plants. We can expect to see additional or new symptoms through September for this current heat wave. Check your plants in the early morning. If they look better in the morning, and worse later on in the day, the problem is most likely heat stress rather than a watering issue. A good example from the vegetable garden is summer squash. In ornamental plants, differences in geraniums and shrubby sages like Cleveland and autumn/summer sages (Salvia greggii/S. microphylla) are fairly easy to see. Some plants, like lavender, rosemary and rock rose, are difficult; you have to look at the leaves pretty closely to notice subtle differences in curling and plumpness. 1. )Use organic mulch to regulate soil temperatures, especially on plants that originate in cooler climates. The popular stone mulches like cobbles and decomposed granite can significantly raise air temperatures around the plants and can raise soil temperatures or prevent temperatures from cooling off enough at night. 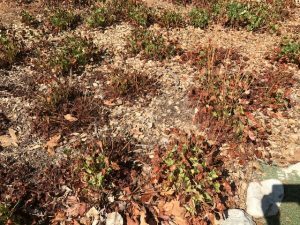 If you have plants that are not low desert-adapted mulched with any kind of rock or gravel and they look stressed out, it’s most likely due to heat stress. Rock mulches are fine for desert-adapted species, but many succulents are not true desert plants and shrivel up in summer heat, even in the shade, when surrounded by granite or rock. One kind of organic mulch to consider is living: ground covers, even vines, that act as a cooling mechanism to soil and neighboring plants. 2) Make sure the soil is well hydrated, but not saturated, especially below 20 inches, in advance of the heat wave, and then avoid over watering at the soil surface level during the heat wave. This is especially true for many CA native gardens. 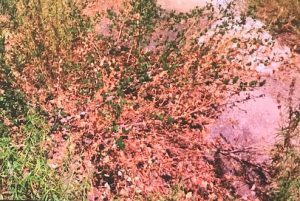 If your ceanothus, manzanita, sage or buckwheat have entire brown branches, up to half of the plant sometimes, but also has other branches that look quite healthy, this is probably some kind of root rot caused by over watering. If the plant is losing leaves or drying out evenly, through the whole plant, it may be an indication that another deep soaking will help. 3)Hose your plants off every three to five days during a heat wave. Ideally, this should be done in the evening or early morning, and when there is no breeze. The effect is a temporary cooling, but it can help the plant go from barely surviving to tolerating well. Plus it keeps the mites and other pest insects off your stressed plants. This point of this is NOT to provide more water to the roots, and if no water hits the ground, that is okay or even preferable for some species. Remember to follow your water district’s guidelines, and best water-saving practices always, like using a hose shut off, and not setting up a sprinkler and walking away. This is hand-hosing work, which is actually pretty enjoyable. 4)Deep water plants and trees, year-round, in all circumstances. Go for duration over frequency. If you have fine (clay) soils, practice irrigation cycling to maximize percolation and reduce run off. Deep watering, even in sandy soils, encourages plants to have deep roots, which protects them from stress events of all kinds. 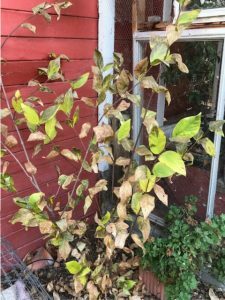 5)Prune off dead plant material after the heat wave, not during. Try to tolerate a little brown, while your plants are stressing out. Every cut is a wound, which is a stress. 6)Once the weather cools, move the plant to a shadier location, or plant a screening tree or shrub on the south side of a prized plant. This doesn’t work for all plants, but the small reduction in sunlight might help it withstand the high temperature stress. This is especially useful for those plants that don’t thrive with summer water. This all may sound overwhelming to a gardening novice, or even to experienced gardeners, especially in a heat wave, when you may just want to be out of town, in the swimming pool, or inside in A/C. Actually, many plants do fine if you just pretty much ignore them. That means, however, ignoring the brown parts, ignoring parts that might look like the plant is dying, and ignoring the lack of flowers. It may mean you will want to add some heat-adapted plants, here and there, or in a separate garden room, this fall and early winter, to help your garden look okay right through summer. It may mean you’ll want to make some changes in mulch or irrigation practices once fall comes and we can really get into and work in our gardens. Cooler weather will come. Eventually. Suat Irmak from the University of Nebraska Extension -article from June 2016: http://cropwatch.unl.edu/2016/impacts-extreme-heat-stress-and-increased-soil-temperature-plant-growth-and-development. Angelica Elliott, Landscape and Gardening Education Coordinator, Desert Botanical Garden, Phoenix AZ: Applied Desert Ecology of the Home Landscape, presented at the 2017 UC Master Gardener Conference. 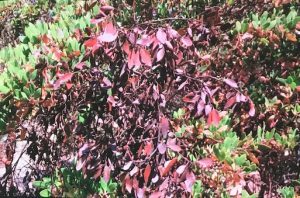 California native plants, ceanothus, Central Valley, drought tolerant, gardening in California, heat stress, inland CA gardens, manzanita, sage., Southern Sierra, Summer. Bookmark.